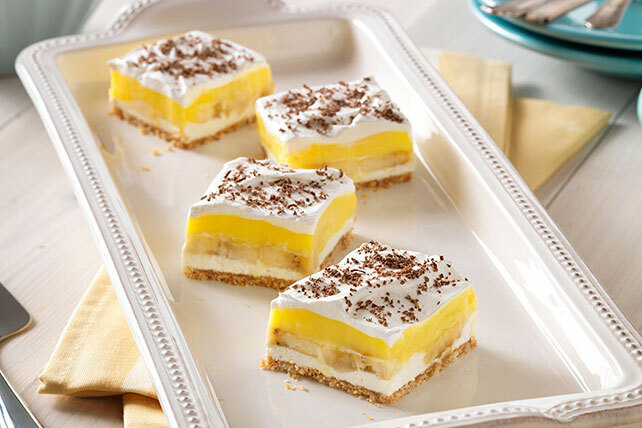 Enjoy luscious layers of cookie crust, sliced bananas and more in these Banana Pudding Squares. There's nothing uncool about our Banana Pudding Squares! Prepare using JELL-O Chocolate Flavor Sugar Free Fat Free Instant Pudding. For easy cleanup, line dish with foil before using as directed. To line the dish, place dish upside down and fit a piece of foil over top of dish, smoothing corners as needed. Remove foil. When you turn the dish over, the foil fits perfectly inside the dish. Use to prepare dessert as directed. When ready to serve the chilled dessert, use foil handles to remove dessert from dish before cutting into pieces.